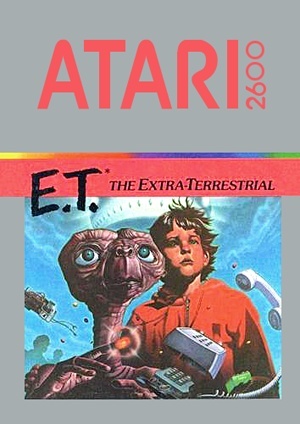 It was 1982, and that summer saw the release of one of the greatest movies of my childhood, “E.T the Extra-Terrestrial”. Of course, along with that came the obligatory merchandising. This included one of the most notorious pieces ever released: The Atari 2600 video game. This video game was so bad, people returned it in droves. Millions went unsold. Stores sent back unopened crates to Atari. And, as a nerd of a certain age, I had a copy of the game. I kept it and played it. Yes, it was horrible. The game plot had nothing to do with the movie. You basically walked around 3 repeating screens, dodging FBI agents and falling into pits. The goal is to collect the parts of the “phone home machine” and leave the planet. I never found more than one or two. According to legend, in 1984 Atari trucked multiple semi truck loads of unsold and returned cartridges to a landfill near Alamogordo, New Mexico. There they were dumped, crushed and buried under concrete. This tomb has never been opened. A local TV station in Albuquerque is reporting a Canadian film production company, Fuel Industries, has been granted permission to excavate the legendary dump site as part of a documentary on the legend of the dump. This would coincide with the 30th anniversary of the legendary deposit. What will they find? Millions of unsold ET cartridges? Busted consoles? The Rock-afire Explosion? Post your guesses in the comments below. We here at Nerditis will keep watching the wire and see what develops. ← Nursery Rhymes GONE NERD! What do you think is in the landfill?